Duty calls. 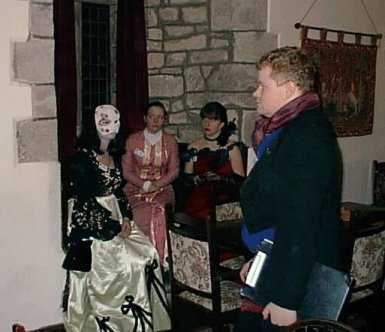 Julian the Scrivener (Gavin Hutchinson) goes about his business, oblivious to the charming, if pensive, group in the background - from left to right - Gilles de Rais (Belinda Brewer), Countess Riemar 'the Swan' (Gemma Dorney) and the Lady Orlando (Chiara McCall). A sizeable grouping, this, clustered around the evidence of nefarious deeds on a certain grassy knoll at the rear of the Tower. 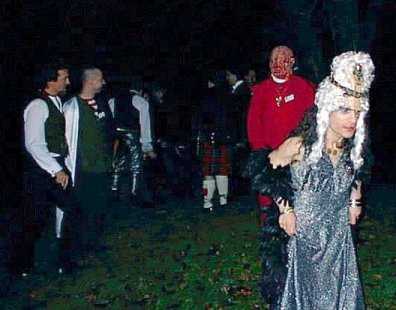 From left to right we have Meacham Squires (Alan Tidy), John Blackthorne (Ian Mason), and then in the background the Ghoul Crouch (Ian Andrews), the bekilted David, Lord Soulis (Olly Godby). Moving to the foreground again we spy the unfortunate visage of Archbishop Thomas Cromwell (Alan Northcott), and then the precipitous exit of Agrippina (Michael Bingas), of Clan Malkavian, as if you couldn't guess. How pleasant it is to greet a visitor from the Colonies! 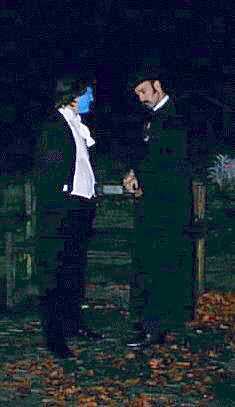 Here we see the wode-bedizened Gangrel Master Lewis (Mark Whittaker) meeting with Andrew Winchester (Morgan Nash), of the American branch of the Clan. Mr Winchester's dustcoat conceals a number of weapons, as befits a traveller in the 'Wild West'. And those are real sideburns.